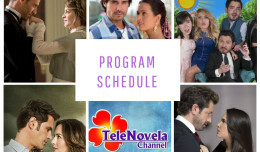 In the Name of Love: Episode 69 | TeleNovela Channel - Bringing you closer to lifes drama. Roberto informs Samuel that Romina and Camila went to see him and thinks Camila is interested in him again. Samuel gets surprised when he learns that Camila has a boyfriend. Meanwhile, Paloma innocently gives Carlota the papers which the latter burns. After Macarena’s death, Paloma turns away from God while Emiliano tries to convince her to return to her faith.